"Cold Eyes" has been invited to the Gala Presentations of this year's Toronto International Film Festival. The film fest, the largest of its kind in North America, will take place for 10 days from Sept. 5, drawing many moviegoers and industry figures from around the world. Other films to be presented in the same section include "American Dreams in China" directed by Peter Chan, Ron Howard's "Rush," "The Art of the Steal" directed by Don Argott, and John Wells' "August: Osage County" starring Meryl Streep, Julia Roberts and Ewan McGregor. "Cold Eyes" is the third Korean film to be invited to the film fest's main section, followed by "The Good, the Bad and the Weird" in 2008 and "The Housemaid" in 2010. The movie has been sweeping the Korean box office since it was released on July 3. 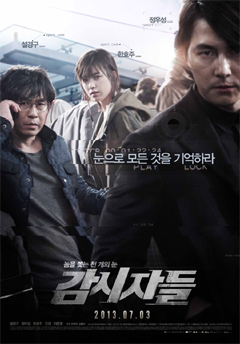 It revolves around a group of detectives who track down high-profile criminals.